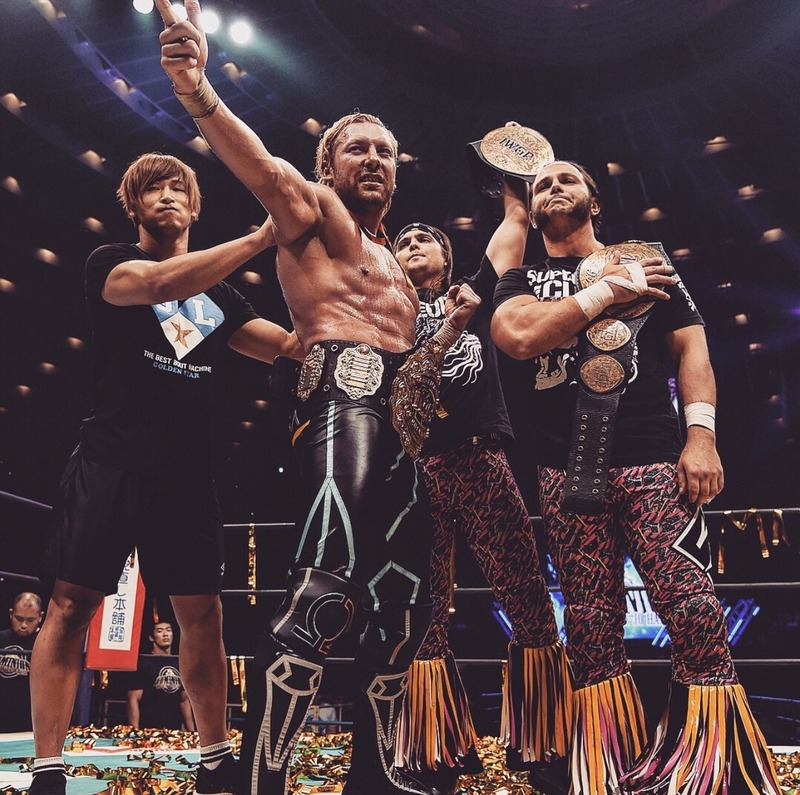 It's unofficially Kenny Omega Week here at the Smark Henry Offices, as we celebrate his huge IWGP Heavyweight Championship win at Dominion last Saturday! That's why it's only fitting that we feature his NJPW theme, "Devil's Sky," on this week's #TST. The song opens with a very ominous intro, similar to what you'd hear in a final battle with a video game boss. Not surprising at all, considering Omega's immense love for video games. It's a long intro, which sounds fitting for some smoke machine effects and a dimming of the lights. Hey, if you're a video game boss—or in this case, the IWGP Heavyweight champ—you make your opponent wait in the ring, dammit! The beat drops around 20 seconds in and it's a glorious mix of synths, guitar riffs, and haunting vocals. It blends together the threatening and menacing vibe of the intro, along with the badassery of commanding your attention because you're about to see one of the best damn matches in your entire life. Given all the elements and production that go into the song, it really sounds like something a kontrabida (villain) would go out to, which is sort of strange now that Kenny Omega's a babyface, for all intents and purposes. But like most iconic wrestlers and their themes, once it sticks, it's really hard to change what's already working. NJPW entrances—particularly at big shows like Dominion or Wrestle Kingdom—tend to be long, so if you've seen Kenny Omega's entrance at a show, you'll probably notice the interlude at the 1:28 mark. It's a mix of keys and hi-hats, along with some synthesized, garbled vocals, that calm you down before the next big drop, which takes you to the song's final act. That final act is basically the hook all over again, with all the elements cranked up to eleven, as it culminates. The one thing I don't like about the theme is how it doesn't really end with a bang. It sort of tapers down and ends weakly, especially considering how the rest of the theme comes out like a marching band anthem, to a degree. What I really appreciate about this theme by Yonosuke Kitamura, who produces and creates the themes of NJPW wrestlers, is that it's not a repetitive loop. Yes, "Devil's Sky" is an instrumental, like most New Japan themes. But you don't feel like it's lazily put together, unlike the crap CFO$ rolls out. You don't just get one verse and a hook looping all over like a Taiwanese pop song. You get an intro, a hook, even an interlude, and then your hook leading up to your finish. Say what you want about instrumentals, but at least Kitamura gets creative with his work. "Devil's Sky" is a pretty cool theme, one that actually appeals to my dorky side, and to Kenny Omega's gamer side, as well. It's not something we can all sing along to, and we'd definitely look like dweebs if we hummed aloud to it like fans do when Shinsuke Nakamura's WWE theme plays. But it works for what it is: a song that establishes that a real life video game boss is coming out to prove once again why he's the world's Best Bout Machine today. Long live the new IWGP Heavyweight Champion!